If you have any questions about the SEA CLOUD information page below please contact us. 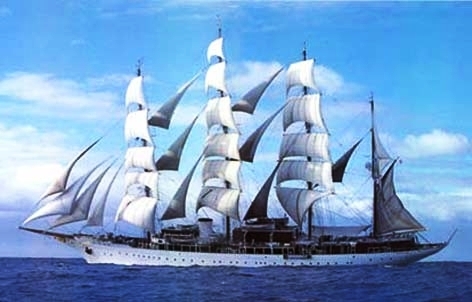 SEA CLOUD used to be project/yacht name Hussar Ii; Sea Cloud; Angelita; Antarna; Sea Cloud; Sea Cloud Of Grand Cayman. This 110 m (359 foot) luxury yacht was built at Germaniawerft Fr Krupp Ag in 1931. Sailing Yacht SEA CLOUD is a major superyacht. The firm of naval architecture that made her drawings on the yacht was Cox & Stevens. Luxury yacht SEA CLOUD is a well crafted yacht that is able to sleep up to 6 people on board and has approximately 65 crew members. As the largest sailing yacht ever built at that time, the four-masted barque was commissioned by E. F. Hutton, one of Wall Street’s wealthiest businessmen. His wife, Marjorie Merriweather Post, who was heiress to a huge fortune and herself a successful businesswoman designed the luxury yacht – which was then called HUSSAN and had a black hull. When the couple divorced in 1935, Marjorie kept the yacht renamed it Sea Cloud. It was then used by the US army during WWII and used as a weather station. She was then restored and sold on to Dominican dictator Rafael Trujillo in 1955 who renamed it Angelita. After Trujillo was assassinated in 1961 she was renamed Patria. Five years later the PATRIA returned to American hands and was renamed Antama. She was restored again in 1979 and renamed Sea Cloud by a German owner and offered for charter cruises. One interesting feature of the current yacht is a white plaque with five brass stripes, mounted on the front of the wheelhouse under the bridge. Each stripe stands for a half year of active military service for the USA. 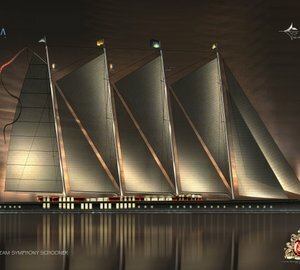 Cox & Stevens was the naval architecture company involved in the formal superyacht design work for SEA CLOUD. Also the company Cox & Stevens successfully collaborated on this project. Created by Germaniawerft Fr Krupp Ag this yacht was constructed in the country of Germany. She was successfully launched in Kiel in 1931 before being delivered to the owner. Her hull was constructed with steel. The sailing yacht main superstructure is fabricated extensively with steelandteak. The measurement of the luxury yacht on deck is 96.35 (316.1 ft). With a beam of 14.9 metres or 48.9 ft SEA CLOUD has sizeable room. A deep draught of 5.12m (16.8ft) determines the list of overall marinas she can enter into, taking into account their minimum depth at low tide. She had refit improvement and alteration work completed in 2003. The 8VD engine powering the yacht is produced by SKL. For propulsion SEA CLOUD has a single screw propeller. The main engine of the yacht gives 1050 horse power (or 773 kilowatts). She is fitted with 1 engines. The combined output for the boat is 1050 HP / 773 KW. With volume for a limit of 6 yacht guests spending the night, the SEA CLOUD accommodates them in luxury. Normally the vessel utilises approximately 65 capable yacht crew to manage. 109.52 metres / 359.3 feet. Giving the combined power of 1050 HP /773 KW. Cruising at a speed of 12 knots. Motta San Giovanni. Italy. Provincia di Reggio di Calabria. Calabria. On Sept 2009 SEA CLOUD visited Motta San Giovanni, in Italy. This sailing yacht also cruised the cruising ground including Provincia di Reggio di Calabria during the month of Sept 2009. She has a teak deck. The luxury yacht SEA CLOUD displayed on this page is merely informational and she is not necessarily available for yacht charter or for sale, nor is she represented or marketed in anyway by CharterWorld. This web page and the superyacht information contained herein is not contractual. All yacht specifications and informations are displayed in good faith but CharterWorld does not warrant or assume any legal liability or responsibility for the current accuracy, completeness, validity, or usefulness of any superyacht information and/or images displayed. All boat information is subject to change without prior notice and may not be current.